Monday staff are also tasked with running inventory reports for my review, as weekend sales have (hopefully) depleted some sections, allowing us to move things around to feature less obvious items, and perhaps free up some space for the next day’s arrivals. It was a revelation to me to learn, some years ago, about the Top 25 sellers in my store, and to focus on restocking those items every 7 days. Avoiding the discordant “I’m sorry, we’re out of that” conversation made everyone whistle a happier tune. Tuesdays bring morning Stories & Snacks, led by a part-time heroic staff member who also teaches preschool. “Unflappable” is a key descriptive quality in our job applicants, along with “Swiffer-certified” and “alphabet savvy.” A working knowledge of animated characters, Pokemon powers, and t-ball registration dates are also useful for that shift, as the preschool moms and their charges visit us on the day BEFORE the local library does their big story time. Note to new stores: if you want to increase your morning event attendance, look for the “dead days” in your community calendar, plan to end right before lunch, and post a note or two on the MOPS Facebook pages. As a predictable release day, Tuesday is also ALL ABOUT NEW BOOKS at our place, and lots of titles are scooted around to make room for new arrivals and special orders are bundled and stacked. Our end-of-day crew on Monday usually pulls damaged titles (also heavier after the weekend) and makes a valiant attempt at re-alphabetizing picture books, but it is usually the Early Chapter section, that cacophony of series with 32-plus titles and names that all sound vaguely the same (WE SURVIVED the MAGIC TREEHOUSE adventure by saving the MAGIC BUNNY from HORRIBLE HARRY and his band of RAINBOW FAIRIES… you know what I mean) but are totally impossible to sell if we’re missing volumes #1, 2, and/or 3. Entire shelves of little glittered paperbacks will languish without the right opening notes of introduction, so on Tuesdays we do a physical inventory and send off orders con allegro. 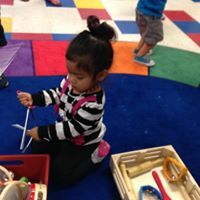 On Wednesdays we schedule and host playgroups in the morning or present special “one-time” events, which usually requires two regular staffers on the floor and one in the back, those experienced stalwarts who can book talk, gift wrap, deal with bathroom emergencies and costumed characters in concert. As a reward for what is usually a hectic morning, at least two spend Wednesday afternoons in the Young Adult section, pulling returns, swapping favorite titles, and propping new titles in the FEATURED READS display. We sell the most YA books on Thursdays — I’m not sure if that’s because of the staff attention to the section on the day before or a need for parents and teens to pick up new reads for the weekend. Either way, it’s a nice change of tempo for both conversation and melody. Thursdays are the last day to place orders for weekend birthday parties, and so there are automatic alarms set on our phones to ring at 11:45 am (to meet the wholesaler’s noon deadline for ordering leveled readers for party treat bags) and again at 4:00 pm for the call to our sainted cupcake baker, who fulfills requests for custom-made sweets in any theme, in any color, in any quantity — but needs to bake on Fridays to deliver to us on the weekend. Notes are scribbled in the margin of the party reservation forms as staff make confirmation phone calls… “that’s 12 three year olds, one five year old brother and his best friend, the nine year old next-door-neighbor who is allergic to tree nuts, and NO RED BALLOONS… got it” like conductor’s notes on a score, and we begin to strategize the set changes between events for the weekend. 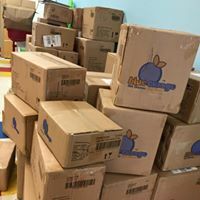 Afternoon staff sets up the back room for Thursday evening events, and I usually send someone back to file the new ARCs on the stock room shelf and pull the now-published titles for donation. 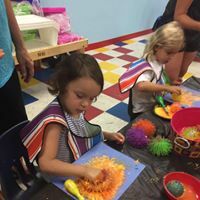 On Friday we host our local Gymboree Play and Music franchise for Parent/Child Art Class, and set the stage for weekend activities and events. There’s often a little lull on Friday afternoons, right after lunch and before carpool time, whispering the possibility of a stolen hour reading…. which is inevitably dashed by the cymbal crash of a large delivery of boxes. There’s nothing like a “clean” store to beckon a big delivery truck, and nothing like a big stack of boxes to attract a crowd of high maintenance customers demanding attention while the towering stack of cardboard deadens the faint imagined melody of an on-time closing. I’m reminded of all the backstage hustle of an orchestra crew, moving chairs and stands and risers to create that opening curtain of a Saturday morning in a kids’ store: our version of opening night. There is no special emphasis on any one section on Saturdays, as it’s all “performance” — a flurry of gift wrapping, book selection assistance, party management and a fortissimo level of energy. Sundays, however, bring some quieter spells, a much overdue straightening of Middle Grade, special order entry, and setting up for Monday morning’s opening event. And so we sing another week’s refrain, and keep our little business humming along. This entry was posted in Uncategorized on March 14, 2018 by Cynthia Compton.